Mr. Walters’ practice focuses in the area of real estate development from initial planning and entity formation to project completion, including litigation related to project development. Mr. Walters is particularly experienced in land use and zoning matters including environmental impact review pursuant to the State Environmental Quality Review Act and the National Environmental Policy Act. Mr. Walters has represented many developers and governmental agencies regarding the development of commercial and industrial projects including the development of “shovel ready” business parks and matters related to economic incentives. 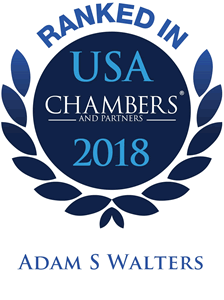 Mr. Walters also has extensive experience in environmental law including environmental due diligence and permitting for industrial facilities under the Clean Air Act. He is a member of the firm’s Energy Practice Team handling matters relating to the development of wind and solar energy facilities. Mr. Walters is also a member of the firm’s Telecommunications Practice Team handling, in particular, matters relating to the development and modification of cell towers and other communications facilities. Land Use Planning & Zoning – Assist clients in analyzing zoning requirements for commercial developments and residential subdivisions. Prepare letters of intent and applications to obtain necessary approvals, such as special permits, use variances and architectural review approvals from Town Boards, Planning Boards and Zoning Boards of Appeal. Assist clients in seeking all required and relevant New York State Department of Environmental Conservation permits. Assist client in resolving zoning-related litigation and related to subdivision approvals and use variances. Real Estate Development – Assist clients in all aspects of real estate development, from initial project planning and entity formation to project approvals and permitting, to construction, occupancy and stabilization, and withdrawal of project equity. SEQR Act – Conduct environmental impact assessments for residential subdivisions, industrial, and commercial projects, including drafting environmental impact statements, negative declarations, public notice and hearing documents and general project coordination and development. Assist clients in defending and/or challenging SEQR decisions pursuant to Article 78 of the Civil Practice Laws and Rules. NEPA – Conduct environmental impact assessments for federal transportation projects, including drafting environmental impact statements and assisting in the preparation of environmental studies to analyze impacts. Counsel clients with regard to federal agency- and project-specific requirements, such as compliance with Section 4(f) of the Department of Transportation Act of 1966 and National Historic Preservation Act, among others. Clean Air Act – Assist clients in determining Clean Air Act permit requirements for industrial facilities and counsel clients on compliance and enforcement issues. Greenhouse Gas Regulation – Counsel clients on compliance issues related to RGGI and proposed greenhouse gas regulations, including EPA’s greenhouse gas emissions monitoring program and proposed tailoring rule, and legislation related to a federal cap-and-trade program. Wetlands – Assist clients in seeking and obtaining both state and federal wetland permits. Assist clients in defending against enforcement actions related to wetland violations and negotiating Consent Orders. Stormwater– Assist clients in all aspects of stormwater permitting. Assist clients in identifying permit requirements. Complete the required notice and permit documentation for State Pollution Discharge Eliminations System permits. Assist clients in preparing Stormwater Pollution Prevention Plans. Provide clients with assistance in identifying alternatives in the stormwater control plan to build consensus with neighboring property owners that object to proposed project and the stormwater control measures. Telecommunications – Assist clients in analyzing zoning requirements for telecommunications facilities. Prepare letters of intent and applications to obtain necessary approvals, such as special permits, use variances and architectural review approvals from Town Boards, Planning Boards and Zoning Boards of Appeal. Assist clients with general project coordination and development. Review leases and lease amendments for telecommunications facilities, including new construction, collocations on existing towers, and structure agreements to locate on rooftops or other existing structures. Assist clients in resolving permit fee and zoning-related disputes arising from the unlawful application of zoning requirements to telecommunications facilities. Hilbert College, Adjunct Professor – As an adjunct, Mr. Walters taught an overview course in environmental law. New Millennium Group of Western New York, Former Member – Board of Directors – Mr. Walters was a founding member and served as the first President of the Board of Directors of the New Millennium Group of Western New York, Inc., a community action group dedicated to implementing positive change in the Buffalo-Niagara Region.